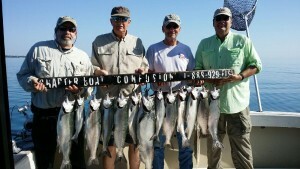 The Confusion Boats operate these vacation packages only out of Northpoint Marina. This is a private charter / Rates are based on groups of 2 thru 6 persons however rates are also available for lesser and greater sized groups. Please call! (Maximum of 6 persons per boat) Fishing licenses are available on the boat at an additional cost for the appropriate state we are fishing. They can also be obtained online if you prefer. Please see our FAQ’s Page for license costs and details! For multi boat groups or parties with more than 6 persons go to my multi-boat page. All Tackle & Bait – Rods, Reels etc. 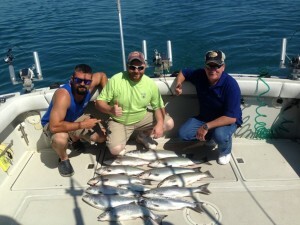 2-Day Packages usually consist of an afternoon charter followed by a morning charter. Recommendation – 1st day – Afternoon, 2nd Day Morning & 3rd Day Morning . Recommendation – 1st day – Afternoon, 2nd Day Morning ,3rd Day Morning & 4th Day Morning. *Customized trips / Extra Nights lodging and additional days available.